ALWAYS brand Intense Pulsed Light is a technology aimed at producing light of a high intensity in a short period of time. The light emitted during the flash is absorbed by the melanin contained in the hair follicle, which is then converted in thermal energy. The heat produced will then destroy the hair by cauterizing the vessels connected to the base of the hair: the hair falls out and never grows again. As far as hair removal is concerned, the most important part of the hair is its pigment, the melanin, which gives the hair its colour. There are as many pigments as there are individuals. Every pigment type requires a certain wavelength of light. Contrary to the laser which produces a monochromatic light (single wavelength), the flash lamp produces a multitude of wavelengths. This allows many different hair pigments to be targeted by one pulse of light. When the selected magnetic pulse light of a specific wavelength acts on the skin, the hairs (dermal papilla) in a growth phase within hair follicles that are rich in sebaceous glands can split after absorbing the energy, so that the follicle cells grow old naturally, then the hairs are lost and the pigment granules in the hair follicle are subsequently engulfed by macrophages and excluded by human metabolism. Fully and effectively improve skin texture; treat a great variety of skin blemishes and lesions. Freckle removal: Remove or dilute all kinds of facial stains, such as ephelides, sunburns, age pigments, coffee spots and all kinds of pigmentations. Skin Rejuvenation: Whiten and remove yellow pigment, shrink pores, improve skin roughness, increase skin elasticity, smooth fine wrinkles, remove and dilute the acne scars. Red blood streak: Remove facial red blood streak, erythema, acne rosacea. Hair removal: Effectively remove unwanted hair on all parts of the body, such as armpit hair, beard, lip hair, chignon, bikini line and four-limb hair. Pimples: Acne type Pimples, allergic Pimples, scarring type pimples. 1. Permanent hair removal for various hair color. 2. Imported super powerful refrigeration system from America, Realize cold anesthesia;djustable cooling system control by software. 3. Adopt medical import sapphire, Energy output uniformity, various spot size free to choose. 4. Plug-and-play connectors makes install more easily, safe and reliable. 5. 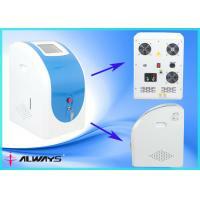 Alert device for failure of water level, water temp, water instability and refrigeration. 6. No Pain, No side effect, treatment with short time, no any effect for daily life. 7. Magnetic drive Japanese pump + big water tank controll water circulation: lower noise, longer lifetime.